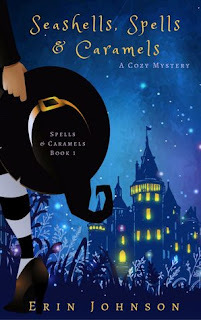 It’s been *years* since I’ve read a cozy mystery and I’ve never read a cozy paranormal. One with magic and witches sounds like so much fun! I’m so glad this was an overall win for you, even if there wasn’t a strong connection with the characters. This sounds really fun and I love the cover! Too bad it wasn't fleshed out a little more. I might give it a try anyway, especially when I'm in the mood for some fluff. This sounds darling—magically fluffy, just what I'm in the mood for sometimes! I really like the sound of this one and the mix of paranormal and cozy. And the fact that you liked it during a blah reading time. Bake Off with witches sounds fun! I bought it :) Thank you. Oh Kim I hope you like it as much as I do, it's such a unique read!! I am now on Book 2! I love this series!! I am currently reading Book 2, Black Arts,Tarts and Gypsy Carts. And I like Imogen and I love meeting new characters as the series goes on, I am a huge fan and actually a big fan of Erin Johnson now, I enjoy the touches of Harry Potter also!! I want to read this one. It looks so good. I haven't heard of this one before but it sounds like a ton of fun. Definitely worth a try!